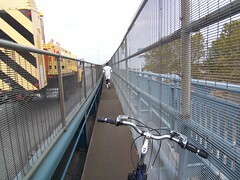 Greater Philadelphia Bicycle News: Welcome Back North Walkway! DRPA put icing on the cake this morning by also dialing back the walkway hours to 7PM. In fact newspaper reports specifically stated last week that the 8PM closure time would continue. The intention was to simultaneously close the South walkway so that they can do painting work on that side of the bridge. If the South walkway is not closed yet I believe they intend to close it soon. The early closure is really disappointing. Many of us use that extra hour as insurance to avoid being closed out on our homeward bound commute. 7 PM is too early! I encourage other like-minded walkway users to e-mail the DRPA at info@lists.drpa.org. Where did you see 7pm? DRPA still has it posted as 8pm as of Oct 6th. Holy Cow!!! That's damned narrow! I thought the south walkway was bad on the Camden side. How can you even pass someone on foot without literal having to squeeze your bodies against each other, never mind while walking a bike? Totally inexcusable considering the underlying structure is there to widen the walkway to a proper width. What is it with agencies in charge of the bridges over the Delaware with having such an issue with bikes and peds anyway?? This walkway is terrible. i literally had to lift my bike over my head and let peeps ride under me yesterday. Forget about getting around the ligh poles.